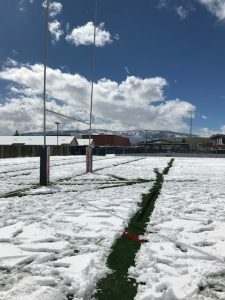 Welcome back everyone and I hope that you all have recovered from what may have been the Greatest Weekend In US Rugby History… more on that below. Lots of action this week as everyone was in full swing and we even had a few teams playing over the Vegas 7s weekend for some strange reason. There were a couple of top of the table clashes scheduled that I had metaphorically circled on the calendar and they didn’t disappoint, but one in particular needs special attention. Before the Vegas break I wrote that the “San Jose Seahawks have alternated between blowing out teams by 50 and winning at the final whistle – including a rare defeat for St Marys B side. There is no middle ground for them – should they have a well managed 10 point win that might be the biggest shock of the season.” They were scheduled to meet with fellow undefeated Sacramento Blackhawks who held the points lead in the table by virtue of playing one more game but San Jose had a decisive lead in the point differential column. This was a classic clash of heavyweights that could go either way as they both came rolling in firing on all cylinders. Will San Jose’s revamped style and never say die attitude beat out Sacramento’s experience, physicality and home field advantage? We had to play to find out and last week I offered a rather tongue in cheek challenge to the Seahawks to keep the excitement going. Responded San Jose, “Hold my beer.” Sacramento was keen to oblige as well. You want to throw everyone for a loop and make not only a single match but the whole league table more exciting? Try having the last two undefeated squads meet in a high scoring game with massive lead swings until the last 20 where it becomes neck and neck, until 5 minutes left when a try to take the lead was followed by a disallowed try that would have extended the lead before culminating in a multi-phase, length of the field sequence by the trailing side resulting in a try at full time for the most incredulous, unexpected, sister-kissing result: a 46-46 tie. The Greatest Weekend In US Rugby History? That’s a bold claim right there, but it deserves some consideration. Who are the other contenders? As impressive as it was, winning the Olympic gold medal in 1920 and 1924 wasn’t really even that big to Americans back then as most of the country didn’t know we had won nor would they have cared much – it was a different era then and the Olympics weren’t as high on society’s radar. To be honest, has the US Men’s curling team won gold in 1924, as unlikely and exciting as that last shot was, there would have been about 40 people who cared. There is too much empty history after our Olympic glory to make it more than an interesting footnote, at best. The USA Women won the inaugural World Cup in 1991 and followed that up with runner up performances in 1994 and 1998. Any time you win a world championship it is hugely impressive. Unfortunately that was more of a seminal event for the rest of the rugby world signaling that they needed to start taking their women seriously and as the tournament grew and the rest of the world caught up we finished out of the top 4 the next 4 tournaments until 2017 where we finished a very respectable 4th. Even then, we played well but lost big against England in pool play and New Zealand in the semis and were clearly outclassed by them. Blame can be placed on coaching, resources, selections or a number of other issues but the point I am making here is that the World Cup win in 1991 was not at the same level of, say, the US Women’s soccer team winning the FIFA World Cup in 1999. The win by the USWNT sparked a huge cult following and even a pro league and today they fill 60,000 seat stadiums for their matches. The win by our Women’s Eagles went largely unnoticed. Unfair comparison? Possibly. Probably. True, nevertheless. At the same time our 15s team was in Uruguay taking care of business against Los Teros. We had already done the hard work in the ARC by beating Argentina and Canada but Uruguay at home is still a difficult opponent. At 61-19 pasting showed our class even with none of our elite European based players available. We have now won the ARC 2 years running and must be considered the class of the Americas… until we play Argentina’s full side. That being said, their ARC team is not to be sniffed at and we beat them – we are not as far off as we used to be. How often has the US won any major World Rugby championship? Much less two at once? So now we come to Sunday, March 4 2018. This may yet be our coming out party, if it is handled right. Unfortunately, the people in charge of USA Rugby’s media relations seem to have fallen asleep on the job. Aside from the EPSN Top 10 clip I didn’t see any major media coverage – and because ESPN was broadcasting the 7s that was possibly the least they could do. This should have been blasted out to all media centers. America loves winners and we were showing the world we could win. The only rugby media I saw generated by RIM? Advertising for Wales and South Africa playing in Washington DC. March 3 and 4 may one day be considered The Greatest Weekend In US Rugby History as the day the US Men announced their arrival to the world. March 3 and 4 may one day be considered The Greatest Weekend In US Rugby History as they day the US Rugby community realized the Rugby International Marketing is not interested in promoting US rugby, but merely in making a profit (and they aren’t good at that, either). March 3 and 4 may one day be considered The Greatest Missed Chance In US Rugby History. Congratulations to Brian Vizard, chairman of the USA Rugby Foundation who won the USA Rugby Foundation I’Maul In Poker tournament, run by Brian Vizard. Hmmmm… I have to tell you it is highly suspicious when the person who runs a poker tournament just happens to win it. I have my eye one you, Viz. Our final Las Vegas note: last year the players played on artificial turf and with the high desert air being so dry combined with high winds, the turf needed to be regularly watered between matches to prevent turf burns on all the players. This year they went back to grass so the end result was, since the surface was grass, they didn’t need to water it. Yup, they had to water the turf but didn’t need to water the grass. Finally after 4 months I can say “SATURDAY IS A RUGBY DAY!” When better to start the beginning of the New England spring season then a day after a ‘noreaster? Since power was out at the Zanarini residence anyway, why not get on the field. Salve Regina is tuning up for the NSCRO Championships while Brown is just tuning up in general. The match was played on the turf at Berylson Family Field and probably the widest setup permitable. This may have been scrimmage on paper (30 minute halves) but the action was full on. There were at least 3 lead changes in the match, Salve was in the lead at the half. I was using a new scorecard and did a poor job of noting when tries were scored, but suffice it to say Brown charged back in the final quarter, dotting down repetitiously. To get some more minutes in my legs, I took on the B-side match (20 minute halves) as we previously agreed in the pre-match emails. A much different game that showed very good athletes taking to rugby. Salve came ahead 10-5. Also, my friend and new referee Michael Adamson came by for his first taste of officiating, taking an AR flag for both matches. Michael has no previous rugby experience save for 2 practices in a Tennessee high school many moons ago. He is a recent Navy vet making his permanent home in Rhode Island. He was for a time my upstairs neighbor where I force fed him rugby during the PRO Rugby and Olympics telecasts. He took to it and came with me to the USA v Ireland match as well. The hook was set after that. He just took the level one and is jumping in. Make sure you buy him a beer when you meet. The journey up the north coast to beautiful Humboldt county was a cold one! The ride up was wet and also snowy on some parts of the 101, but we all managed to arrive in one piece in good time. I was happy to have this match, to officiate my alma mater for the first time and to have my adopted college team with me was a treat. From the start this game was great! With 2 well disciplined sides it was another series of back and forth scoring. Both teams had lots of ball, but Humboldt was able to cash in on the end phases to get into the try zone. Humboldt showed a bit more intent and aggression overall, which contributed to their success. The Cal women were a little less intense, but showed incredible skill and vision when in possession. They had some cracking runs from their backs that were able to weave in and out of traffic, keeping me honest with my speed; one try was scored from deep in their 22m after some quick thinking using a quick tap to push the pace after being awarded a penalty. The second half was less tight for Cal as the sunny first half had changed to rain, and we Humboldt ruggers know how to navigate the worst weather conditions better than most in California. There were many scrums due to knock ons, which stunted some of the momentum that Cal was trying to build. Relentless to the end, the Cal women continued to fight until the final whistle, but Humboldt’s second half consistency allowed them to pull away from a very well contested match with a comfortable scoreline at the end. Thank you to both teams for a lovely skills and an exciting game! For over nine years, the weather gods have not bestowed rain, sleet, hail, or snow on any match I have refereed. Sure, water in one form or another has fallen prior to matches, at halftime, and after matches, but there has been a remarkable lack of precipitation during playing time. And so it was for the onset of this match. Some sprinkles prior to the match and some during halftime but, despite the ominous, foreboding skies, it remained dry. Apparently, the gods on high do not like being taunted, or I told too many people of my precipitation-free streak. The whistle tone for the second half jarred, agitated, and disturbed the molecules with such force that the skies erupted with a downpour of near biblical proportions. Hyperbole? Sure. Nonetheless, the temperature to a five to ten degree downturn and the rain slowly appeared with bits of hail. USF scored two relatively quick tries before UOP was able to stitch together consecutive phases. Ten minutes into the second half, the rain transformed to sticking hail. Five minutes later, a UOP player face down on the ground after contact yelled “My neck! My neck!” A surefire attention-getter, play was stopped to ensure rapid medical attention. While discussing the weather during the break in play, two bolts of lightning flashed across the sky. I offered to wait out the storm but the coaches agreed the players will be too cold to restart. Alas and rightfully so, the game was called. I’m not a superstitious person (too many people knock on wood…. ); however, my pre-match driving playlist will no longer consist of “Again We Rise” (Lambs of God) or “Live for the Kill” (Amon Amarth). One way traffic. UCD down to only 13 players in the second half due to injuries. This was a fairly lopsided match, properly reflected in the scoreline. Chico State was up 0-24 at halftime, and tacked on 31 more points in the second half, including 3 rapid-fire tries by their captain at fullback. In the B side game, Stanford got some points on the board. Halftime was 0-21 to Chico, but Stanford matched them in the second half to finish at 12-33. The occasional microburst didn’t seem to have any effect on the game, though it certainly made things chilly. 4 inches of slushy snow on the field at kick-off. A wet ball and cold hands made for a lot knock-ons. Still Reno was able to put on a show running through the SFSU backs pretty much at will. Great day for rugby this past Saturday. A bit overcast and cool but perfect for rugby…with pitch being in good condition. Aptos/Central Coast hosted Marin in San Jose at Independence High School, Seahawks home field. About a fifteen minute drive for me. Yeah. Kick off delayed five minutes due to a couple of Aptos players running late. Aptos had 16 players or so and Marin had 20 plus. Just a very competitive, open, enjoyable game to referee. Marin scored first at five minutes with a strong run from their fireplug center. Aptos realized Marin came to play and committed tackling was needed. Aptos commitment to the tackle led to a turn over try at 10 minutes. Marin realized how dangerous Aptos can be on turnovers. Score Marin 7- Aptos 5. Marin continued to control the ball early which led to a second converted try at twenty minutes. Aptos tackling led to another turn over try at 26 minutes. Marin finished the first half scoring with a penalty kick. Half time score Marin 17 Aptos 10 Game on. Both teams had about 20 players with a mixture of new heads and old heads; in the end Fresno had more young and physical players as well as more old heads running good support lines. Both teams created some good moves and nice overlaps but Fresno had better fitness overall. Two tries apiece in the first half with one missed conversion for a 14-12 home lead. The second half went more for Fresno with 4 tries to 2 and a final score of 42-26. It was a perfect day for College Women DII’s #1 and #2 to collide to see who will get the top seed. Cooler than the 70’F we’ve been experiencing in Fresno, but still a little warm for the Reno side who’s averaging 40’s. Field, was dry and fast. JHS dominated from the start. This match between two recent national champions proved for hard dedicated rugby. Both teams played like they wanted it. There was no shortage of emotions. Two competitive teams going at it in a good display of rugby, but improvements still to be made by both squads. Life West ran out to 24-0 leaders, so there was never any real jeopardy in terms of the result, but OC came back and later had the score at 36-22. From there, Life West pushed on again and put the game away. This was a pretty close matchup of two as-yet undefeated teams in D3, and it didn’t disappoint, with lots of action. Defense was a big part of the game for both teams. Accordingly, the first score took 23 minutes, with Colusa’s unconverted try. They added another at 33′ to finish the half leading 0-10. Shortly after the second half started, the Diablo #3, who was maybe 5 feet in front of me, kicked an opponent in the face and earned himself a red card. One would think that Diablo playing the last 37 minutes of the match with a 10-point and 1-man deficit would lead to a blowout, but that’s not what happened. Colusa did score next, with another unconverted try at 45′, but Diablo responded with a converted try of their own at 58′ to make it 7-15. Soon thereafter, Diablo made a couple of great breaks, but the would-be finisher dove over the dead ball line before grounding the ball for a try. At 64′, Colusa was awarded a penalty try due to a collapsed 5m scrum on the Diablo goal line (7-22). At the last minute, Diablo scored another converted try to finish the game with a 10-point deficit. It was another beautiful day for some footy down at Stanford University, hosting the Chico State men. Thankfully the weather held up which made for some much better conditions for the match overall. Not soon after the kickoff, did the match get interesting. There was a lot of intense contest the first few minutes, with a penalty awarded to Chico in their attacking 22m. They were able to capitalize off it it with a 3 point jump to get on the board first. Soon after that, Chico earned the only yellow of the match with a shoulder hit to a man off the ball about 6 minutes in. Stanford was able to get down the pitch and get the first try soon after that taking the score up to 7-3. There was a lot of back and forth between the sides in the first half, with Chico having a clearly dominant scrum and better attacking options with the ball. In fact, my “try of the match” goes to Chico’s flyhalf who chip kicked into a nice hole in the Stanford back 3, and was able to gather and bring it in for a try. There were more penalties than usual for me in the first half, I felt like both sides were trying to contest for the ball so intensely that they were constantly testing my standards that I was attempting to enforce. After a relatively evenly matched first half, the halftime score was 15-14 with Chico leading. The second half was much better for me; the teams had now figured out what I wanted from them which led to a significant reduction in penalties. But, the separation was now starting to become obvious as to who was going to have the consistency to pull out the win. There was still much contest, however Chico was able to finish off their stints of possession at key moments with 3 tries dotted down, while Stanford was unable to get anything on the board. They did have plenty of moments of brilliance, but just couldn’t get it together on the final phases to get the points. After a fun and fast game, Chico State came out victorious. A literal run-away match with the Blackhawk finding overlaps in the backfield all-day. The first half ended 42-0. Mendocino traveled with 16 and looked like a couple of their backs would be more suited playing prop. To their credit, the Mendocino defense was able to stiffen up in the second half, plus score a couple of tries. Gloom and the over-hyped predictions of rain did not stop this game for a second. The only thing that did that was that damn ref. This game was exciting and close. Capitals opened the game with the first score. They looked very sharp, controlling the ball, and tempo. GG answered right back. When Sac got the ball back, they systematically marched down the field. But then an errant pass turned the tide. A full pitch length try opened the game up for GG. They didn’t look back. Very competitive match between two well coached teams. LaMo jumped out to an early lead with 4 first half tries to none for SFGG. LaMo had some wonderful strike runners in their backline, #13 specifically proving hard for SFGG to tackle. Repeated team infringements within the 5-meter line saw SFGG’s wing sent to the bin just before the half. HT 22 – 0. Second half saw SFGG score several tries early and LaMo’s #13 sent to the bin for repeated team infringements. The tide seemed to have turned but LaMo regrouped well and kicked a penalty to stem the tide. When #13 returned from the bin, the match returned to more of an arm wrestle and LaMo carried their lead to full-time. FT 30-24. Both teams took five minutes for the intermission and were ready to get on with the match. The Harlots maintained a majority of the possession and spread the ball wide. Despite a number of forward passes, quick hands and crashing offloads were in the recipe for success. Very competitive and fun match to referee. Santa Clara came out strong in the first half scoring three tries to Sac’s one try, scoreline 17 v 5 at halftime. Santa Clara appeared stronger at the breakdown and Sac less disciplined. First-half resulted in two yellow cards for Sac for repeated infringements. It felt like it was going to be a runaway match for Santa Clara. However, Sac got their act together in the second half leveling scores at 22 all, at about the midway point. Santa Clara responded with a converted try, Sac responded with a try but was not able to convert. The match completed with Santa Clara scoring a final converted try. A key difference was Sac’s inability to convert tries (except one), and some discipline issues resulting in three yellow cards. Santa Clara was not without blemish, they did commit a professional foul with a side entry on their goal line resulting in a yellow. Sac quickly scored thereafter, so the harm was repaired. Overall Santa Clara was penalized much less for infringements. 77 total points and a 1 point margin of victory. Two teams battling it out with the Reno coach (KC) providing the only sub for either side. Brings back memories of the old days when “If you don’t start, you don’t play”. The game started a bit ragged, but transformed into a fun game to be a part of. Reno took the opening kick-off and worked their way to their first try. They scored again on their next possession and it looked to be a rout. However, Shasta regrouped and took the lead with 2 tries of their own, one converted. Reno answered back 31 minutes in to retake the lead and Shasta scored a converted try at 37 minutes to end the half ahead 19-15. The second half started like the first with Reno scoring just 3 minutes in to lead 20-19. Then Shasta scored a converted try and an unconverted try to go up 31-20. Reno answered back with their first CONVERTED try to make it 31-27 with 16 minutes to play. Reno scored again at 28 minutes to take a one point lead 32-31. They exchanged converted tries to end the game. Awesome! Just a few drops of rain on an overcast afternoon in Dixon. Both sides were hustling to get their teams sorted out, with a carload from the Peninsula arriving ten minutes before match time. But the bigger Greens carried the day, shutting out the Solo side. Great rugby weather. Wet but not heavy rain. UCSC and Sacramento State were well disciplined as no cards were needed. Penalty count was even. Both teams played hard. Strained my Achilles tendon with only six minutes left in the match. Got through it but it is very tight today. EPA hosted Santa Rosa at Rich May Field. Present to oversee the match was driving force behind the creation of the field Frank Merrill. Santa Rosa controlled the day with excellent set pieces and mauls. By half-time Santa Rosa were up 26-5. With 15 minutes left EPA seemed to find their second wind and proceeded to score 3 well executed tries. A perfect crisp winter’s day in San Jose saw San Jose St host San Francisco St at Independence High School in San Jose. Why is San Jose St playing at Independence High? Because of 12 golfers, 2 alumni and a greedy, shortsighted administration. It really is a stupid, stupid tale that will need to be told in detail at a later time – preferably with many adult beverages involved. The field was correctly if faintly marked as the collegians used the San Jose Seahawk home field markings from their last match. Both sides were ready to go and so, when the time came, we went. The first half started with San Jose St jumping out to a 5 point lead with a try in the first minutes but SF State quickly replied. This set the tone for an even first half as the Spartans reclaimed the lead only to have the Gators reply. The half ended 10-10 as nobody seemed interested in making a conversion, a theme that would continue throughout the match. As Pelicus Caseum Caput reported, it was a lovely day for rugby in Reno. This entry was posted in News on March 15, 2018 by James Hinkin.